Alton Elementary held its annual St. Jude KKountry 95 Radiothon Kickoff on Tuesday, January 23rd. The celebration started with ice cream from the Spring Dipper. Students received this ice cream as a reward for raising almost $11,000.00 last year for St. Jude! 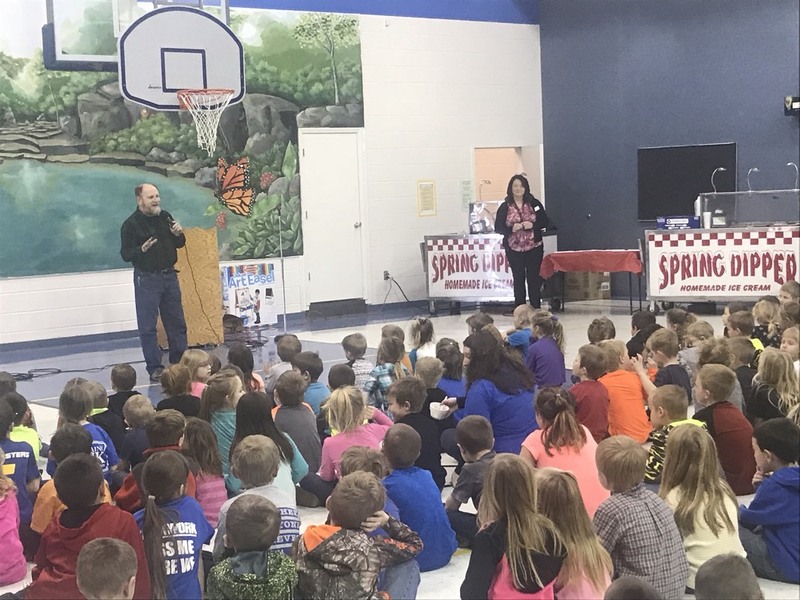 Mike Crase from KKountry 95 lead the assembly with inspiring stories about patients at St. Jude and how the money raised by students will be used to save the lives of children battling cancer. Second grader Mason Simmons was recognized as a survivor and a St. Jude patient. This year, students at Alton Elementary will be working to reach their goal of $8,000.00. To raise money, students will be selling tickets for a chance to win one of two sides of beef donated by Ozarks Regional Stockyards in West Plains. All processing costs will also be covered. The beef will be ready around the end of March. Tickets are $5 for 1 ticket or 6 tickets for $25. Tickets can be purchased from any Alton Elementary student. Classes will also be competing in a penny drive for a chance to throw a pie in their teacher’s face. Both the ticket sales and the penny march will be going on through Monday, February 12th. If students reach their goal, they will receive Spring Dipper Ice Cream. They will also get to cover administrators, who will be dressed as ice cream cones, in their favorite ice cream toppings! For more information, to buy tickets, or to give a monetary donation, please contact Alton Elementary at 778-7217 or ask any Alton Elementary Student. The St. Jude Radiothon is one of the biggest events Alton Elementary students participate in each year. Our students and staff are proud of the money we raise for St. Jude. Please help our students learn the value of helping others by donating money to help the children at St. Jude. Any and all money collected will be greatly appreciated! We are very fortunate to live in such a caring community. Our students truly benefit from seeing the generosity our area shows to those in need. Thanks in advance for supporting our students as well as the patients at St. Jude!